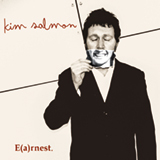 E(a)rnest is the first album in Kim Salmon's 'solo' career to feature only the vocal, instrumental and songwriting talents of Kim Salmon. E(a)rnest is about the singer and the songs. Others may impress you with their noise through the smoke and lights of the party but E(a)rnest is for taking home. E(a)rnest is for lounging about with on a crisp spring day or enjoying in the intimacy of your fireside couch. A final word about E(a)rnest: Even if you're expecting the unexpected, it won't be what you expect. Contains a new reading of Cool Fire which was previously performed by the Beasts Of Bourbon. Strictly limited to 300 copies, be sure to get yours!